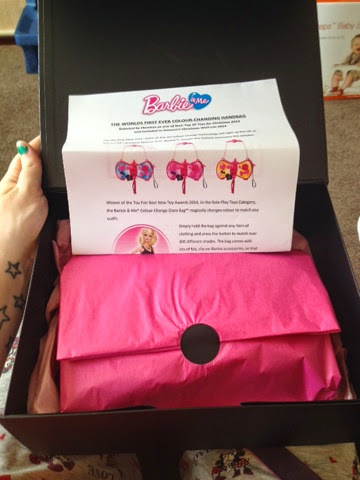 Back in July I attended the Christmas in July event with Amazon and one of the products that really stood out for me amongst the toys was the new Barbie colour changing bag. My first thought when given a demonstration was 'Gracie would love this for Christmas'. Well now I've been lucky enough to test this item out and see what she really thinks of it. 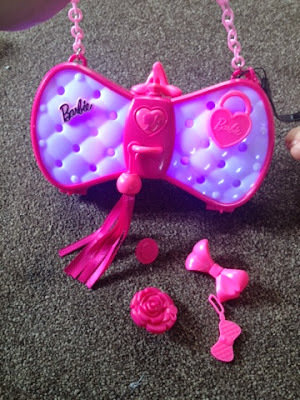 This is definitely a toy for a girly girl, although enjoyed by Zach, so not exclusive to girls I did find that it really did make a great impression on Gracie who likes to think she's a big girl and it really opened up her imagination whilst playing. The bag is great for role playing and the accuracy of the colour changing is pretty impressive. The bag opens up and contains a selection of cute charms which can be stuck on the front to accessorise the bag. To play with the bag and activate the colour changing mode. You simply hold the bag against any item of clothing and press the heart shaped button for the bag to match up the colour. The bag is aimed at girls between 3-7 years and I think it is perfect for girls of that age. 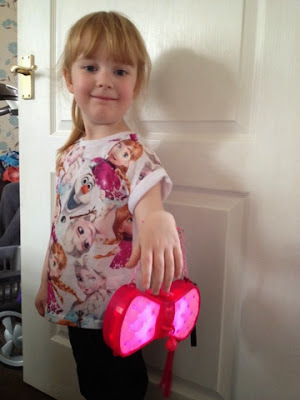 Gracie is only three but has easily learnt how to use it properly and loves it. I have to admit the amount of times the bag has been played with so far definitely justifies the high cost of the bag. The bag retails at £29.99 and will be available to buy at all good UK retailers including both Hamley's and Amazon who will be listing it in their Top 10 Toys For Christmas. I can see this toy being hugely popular and featuring on every little girls Christmas list this year! That is such a lovely pressie for a girlie girl.